Some call graffiti generic vandalism while others call it innovative art. These videos span the spectrum from commonplace to creative and illegal to legal. The artists featured work in groups or individually, are variously known, unknown, famous and infamous. Regardless of your opinion of guerilla street art at large, these scenes provide a unique window into the world of painting, chalking and projecting on streets, walls and other urban surfaces. Reverse Graffiti is a surprisingly difficult activity for law enforcement to define. In this video, a skill street artist carefully but quickly washes the grungy walls of a freeway tunnel to create a haunting series of skulls. Twice in the video the police appear and give him a citation. It is hard to imagine what they could possibly be ticketing him for. 3D Street Art is often sanctioned by a city, which is somewhat strange considering that selectively erasing dirt (as in the first video) can be considered a crime! This fast-forwarded video depicts the world-famous Julian Beaver in the act of creating one of his three-dimensional street art masterpieces. Be sure to watch the whole video, as the most cute and humorous part comes right at the end. Light Graffiti is, by its very nature, completely legal. Artists trace temporary patterns in the air that linger only via time-lapse photography or fast-forward videos like these. This kind of production bears a lot in common with claymation and other forms of stop-motion animation. The variety of patterns show both skill an a unique playfulness inherent in glowstick graffiti. The Infamous Banksy is always at the center of controversies. 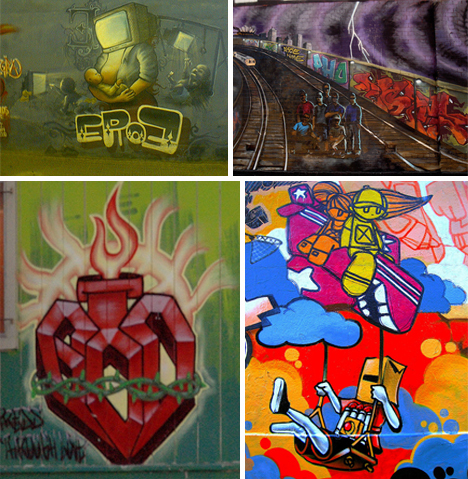 He is variously labeled a sellout or a savior of urban street art. His work has been criticized and praised by politicians, Hollywood stars and virtually every other kin of critic. In this case, he is working in Palestine to raise awareness of both physical and political borders. Whether you consider his recent work creative art or political pandering it is certainly worth considering. Standard Stenciling is normally illegal. Watching the beginning of this sped-up graffiti video it would seem they are perpetrating an illegal action. However, at the end of the video it becomes clear that these guys are operating not only legally but with the express blessing of a local official. Regardless, it is quite interesting to watch these seemingly ordinary tags evolve through a set of complex processes. Train Tagging is most definitely illegal, but it is also very artistically demanding. In these few short minutes of video, shot in real time these taggers manage to cover multiple subway cars. Even more remarkably they are somehow able to keep from being arrested or detained by on-site security personnel. Agree or disagree with their means, motive, method or results, the final scene is impressive.